Reviewers Say Shipton�s Deserves Their Repeat Business! Shipton’s Heating & Cooling opened its doors in 1924. In fact, if you visit our HISTORY page, you can see a picture of founder John E. Shipton leaning against our very first sales counter! 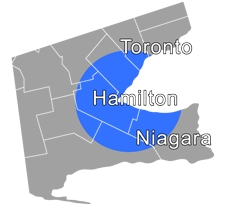 This year will mark our 93rd serving you in the Hamilton, St. Catharines, Oakville, and surrounding areas. Wow! Should you trust us with your heating and cooling business? We think so! But we want to earn your trust the good old-fashioned way, by sharing what other customers have said about our expertise, customer service, guarantees, and work ethic! As always, if you have any questions or want to talk before you decide to go with us, we are ready to answer your calls and emails. You can reach us online anytime or at 905-549-4616 from 8 a.m. to 5 p.m., Monday through Friday. "I had my AC installed over a year ago with Shipton’s. Scott came by and sat down with us and answered all our questions. The installation team was professional and very easy to talk with... Always a pleasure dealing with this company." Here at Shipton’s, we are proud to offer a full line of the finest HVAC, heat pump, heating boiler, and furnace equipment on the market today. From Bryant to Coleman, Weil-McLain to Navien, Fujitsu to Continental, IBC to Shipton’s own eco-friendly brands, not only can we provide you with detailed energy efficiency and pricing information but we are also licensed and equipped to install all brands of cooling and heating equipment. Our specialty is to help you match your energy-use patterns and budget with the optimal heating and cooling equipment so you get the most from your investment with the least initial cost outlay. This includes analyzing your space for the right unit size and capacity as well as taking a look at the appropriate SEER rating to make sure you recoup the initial extra expense in energy savings. If you have ever suffered through an air conditioning or heating outage, you already know all too well how important scheduling your annual inspection and maintenance can be. When our technicians arrive to service your equipment, their goal is to catch small issues well before they can ever become big issues. Our ultimate goal is to do everything we can to prevent you from having any outages, ever. There are few experiences quite so memorable as taking a shower in freezing water… especially if you were expecting that water to be hot! Keeping your hot water heater in prime working order is often as simple as doing an annual inspection and maintenance check while inspecting your unit to identify small signs of wear and tear that need repair. Here again, our goal is to ensure that every time you want hot water for any use, you have it. Shipton’s entire employee family treats our company's service guarantees with the utmost seriousness. These guarantees are not just words on paper to us. They are promises, and we keep the promises we make. If we install a new system and it doesn't meet with your full satisfaction in the first 12 months of service, we will adjust it or refund you the complete price. Our technicians will not use foul language or tobacco products during any service call. They will arrive promptly and ready to work and show the courtesy, respect, and friendliness our brand is known for. If we install your new system and it breaks down within the first 12 months, AND if we cannot get it back up and running within 48 hours of your call, we will pay you $500 for your trouble. We will leave your property in the same condition it was before our technicians arrived. Though we are careful, in the event of damage to anything, we will pay to repair or replace it—no questions asked. We will use all of the latest protective gear while we are working on your property. You pay what we quote you, with no hidden fees or “surprise” costs of any kind. "I have always had great experiences with Shipton's Heating & Cooling. My last experience was awesome, as Kevin and Corey went above and beyond their duties to ensure my furnace was working and that my family was safe. Thanks guys!!!" Often, when we connect with a client who is new to the Shipton’s family, the reason is a heating or cooling emergency that happens at the most inconvenient moment. Luckily, our 24/7 emergency repair service truly is 24/7, which includes weekends, holidays, and into the wee hours of the morning. If you need us, we will be there.